As I mentioned in my post about new year’s resolutions, I really enjoyed making our elopement announcements! Whenever we travel somewhere new, I always buy two postcards. Two, because it’s hard to pick just one and they’re the cheapest souvenirs around so I can justify it. I figure there’ll be more than one way I’ll want to commemorate all these good times. After searching Etsy high and low for what I had dreamed up, I wasn’t finding any luck. 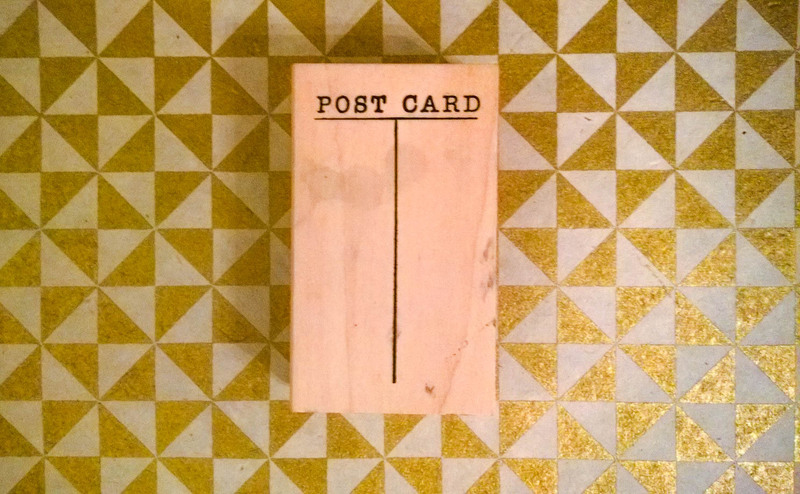 But what I did find was this snazzy little POST CARD stamp at The Paper Source. HELLO, INSPIRATION. 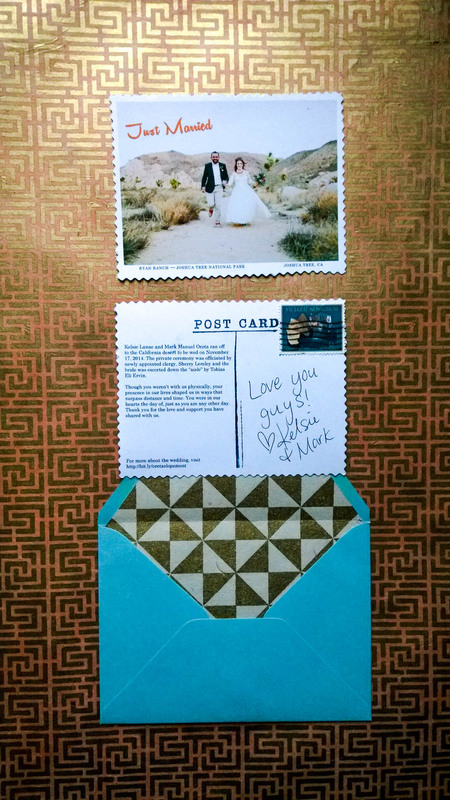 I snatched it up and a few other things to make rough drafts prior to the wedding…then I got the first picture from our photographer, of us running into the desert to elope, and I may have gone a little overboard. This wasn’t fully realized until I was making what seemed like a zillion of them, of course. I decided it needed real vintage stamps. 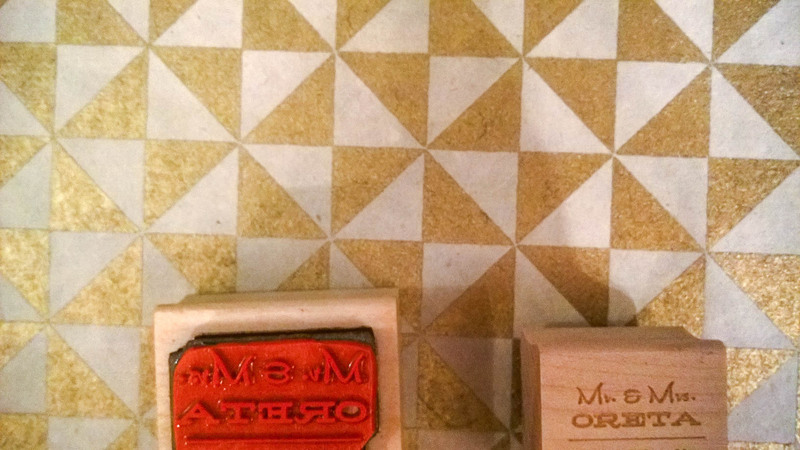 And a personalized address label stamp. Envelope inserts. Typed fresh from my typewriter addresses. Embossing, lots of embossing. And squiggle scissors, of course. Because real vintage postcards were squiggly. I know, I know. I might’ve gone a little Veruca Salt. Apparently, I’m pretty detail oriented. Do you see why I chose to elope? A wedding was more than I could handle! (Sorry not sorry, you can’t see the whole thing with my address! I used InDesign along with some vintage postcard research to add a few Postcard-like elements to it, typed a loving explanation, and worked hard again and again until they were all done! I’m so proud of the results, and once I had a friend along the process was so much fun. I can’t wait to send more letters in 2015! ← Oh yeah, about those 2015 resolutions. Thank you! It was really the best choice for us. If, before our honeymoon in April, we feel like we’re missing out on a party we’ll do something casual at our house or a bar. The wedding thing was too much pressure for me! Thank you! Yesterday and today people who are live in my city have received them and sent me texts complimenting them. Totally obsessed with sending mail now! Would you be willing to make these for me? How many do you need? 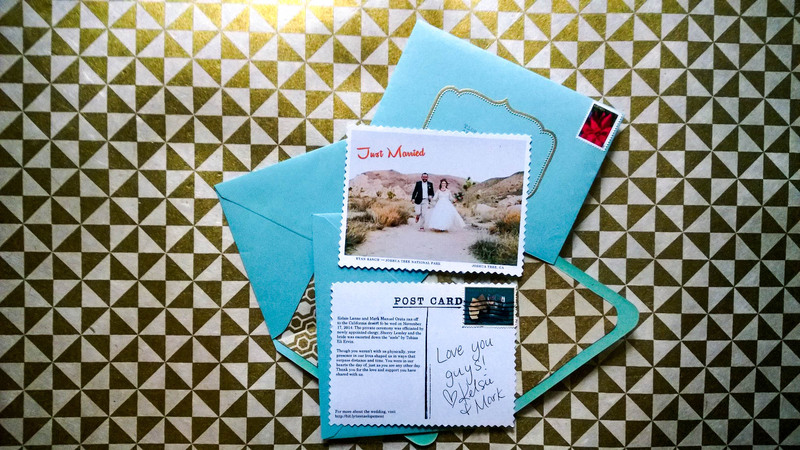 I’m not sure if I’d have the time to do the cutting, stamping, and addressing for a high number of elopement announcements on my own. I can certainly use photo of your choice and create a front/back printable with your information. The printable would yield four announcements per sheet of printer paper. So I totally know this is an old post but it’s absolutely adorable. So much I’m thinking about doing something similar. May I ask what dimensions you used? Hi! I set up the InDesign file to print four even-sized post cards on an A4 sized sheet of photo paper. I must admit, the quality of photo paper that has the ability to run through a home printer is quite flimsy, and I wasn’t 100 percent pleased with the quality. If I were to do it again, I would have stretched my budget a bit to have the printing done by a local print shop, then cut it on my pwn with the zigzag scissors.